Wallace Heim, editor of the Ashden Directory and Ashdenizen Blog for 20 years, has reviewed two books, documenting art science collaborations focused on environments. Imagining Natural Scotland is the publication associated with a programme for the Year of Natural Scotland. Creative Scotland working with Scottish Natural Heritage and other partners put out a call for collaborations. They were looking for new and existing partnerships to put forward projects that focused on the way we understand natural Scotland. The publication highlights the fifteen projects. In a second post tomorrow, Wallace will review Field_Notes, from Landscape to Laboratory. Putting together an artist and someone with a specialism in another field or discipline, usually the sciences, has become so prevalent as a mode of research and art-making, it has become a genre, or a practice in itself – whether it takes place on a boat in the northern seas, in a castle, on a farm, in a village hall, along a city river, in a laboratory. The expectations for original insights and a melding of knowledge and praxis from these collaborations continue to be high, along with the more pragmatic acceptance that these associations are a way of generating work, securing funding and establishing credibility. There’s a mysterious core to these collaborations, those possible moments of generosity and receipt that exceed the mere representation of knowledge in novel forms, or the exchange of information that each can take back to their own disciplinary territory. For the outsider, those moments are never known except as they are described in the documentation that follows, or are evidenced, most often, in the artist’s work. It’s like hearing about a party you missed. Two compilations have been published recently documenting collaborations that relate to ecological arts practices: Imagining Natural Scotland (reviewed below), investigating the natural-cultural place of Scotland, and [Field Notes]. From Landscape to Laboratory (reviewed in the next post), a report from the Field_Notes – Cultivating Ground collaborative laboratory in 2011, hosted by the Finnish Society of Bioart. How are these books to be read? How are despatches back from a collaboration to be read? Some offer philosophical perspectives from aesthetics or environmental ethics; others offer justifications according to funding criteria; others how the project has addressed ecological and artistic needs. All of these read as kinds of meta-narratives. But it’s the descriptive reports of the empirical work that make these collections valuable reading, even if the accounts may be partial, or not even always reliable. Most often, the focus is on the artist’s practice, with how the collaboration affected their working processes, how it contributed to the knowledge that they can use as sources and materials. They are informative of the kinds of art-making being done, the subject matters explored, the combinations that are being made. Often, the commentary by specialists/scientists will offer leads for further questions, lines of connection with their disciplines. Many remark on a moment of freedom from disciplinary restraint, or of a new perspective on their research processes. But there’s little evidence of how this translates into the accredited work of a peer-reviewed paper in a similar way, for example, to the artist’s practice or a completed piece of work. The weight is with the arts. Although the views from the participants are self-reflexive, they often do not undertake a critical perspective on the collaboration itself. One wants to know more about the flowing exchanges and the rankling frictions between divergent working processes. One wants to know more about the risks and negotiations made at personal, political, aesthetic and ecological levels. And, the voice that is most often absent is that of the public or communities who are often co-collaborators through artists’ social and dialogic practices. Even so, these kinds of collections, including the two reviewed here, provide markers of the practices that are defining evolving fields of work and a sampling of the questions that artists ask. These reports offer a multitude of diverse ways-in to ecological art practices for those new to it, and enough detail for those familiar with the fields to mark the shifts in practices that are happening. Imagining Natural Scotland is a record of the fifteen collaborative projects with artists, scientists, social scientists and environmental historians supported by Creative Scotland, Scottish Natural Heritage and others as part of the Year of Natural Scotland in 2013. Creative Scotland’s brief to the projects was to explore the relationship between Scotland’s ‘natural’ world and its representation in arts and in popular culture, to explore the differences between the ‘real’ Scottish ‘nature’ and its cultural representations. Further, to ask how could the arts and popular culture influence society, public attitudes, policy and environmental management. Each partner reflects on their project in relation to the brief. The projects are diverse with overlaps in their artistic methods and in their attention to the land, to river and marine environments, to woodlands and animals. Some directly involve public communities, others work with invited groups or publics. What emerges from the whole are the big themes of the human in the landscape, what is ‘nature’ and ‘natural’. Too, the book confirms a vitality specific to Scotland in how artists are grappling with the ‘place’ of the country, as natural-cultural, as natural-political. There’s a sense of artists and their partners working within the historical conflicts and legacies of land use and aesthetic representations, while newly creating what Scottish nature and culture are and will be. Following are summaries of the projects, favouring the artistic practices. Two different collaborations explore the relation of land use policies and management to the landscape and perceptions of place. In A New Environmental Impact Assessment for Natural Scotland – Environment, Imagination and Aesthetics, the artists Robbie Coleman and Jo Hodges, with sociologist Claire Haggett suggest that beauty, naturalness and the impact of change on a community are the missing – and necessary – tools for assessing the impact of large-scale developments. Their co-collaborators were a community in South West Scotland near both an existing and proposed wind farm. They undertook diverse processes, such as mapping journeys, views and memories; devising fictional scenarios; representing a community narrative through a fictional film called ‘Settlement’ complete with film posters featuring individual families; and making a collaborative soundscape broadcast on ‘Settlement Radio’. All were derived from ‘meet-ups’ with the community. A copy of the ‘outputs’ from the project were printed in the style of an EIA, and buried by the community as a time capsule to provide archaeological information for planners in 900 years. In Future Forest: Caledonian Black Wood, Aware Access, environmental artists Tim Collins and Reiko Goto and social scientist David Edwards considered what it means to make art with a forest, rather than about or in a forest, specifically, the Black Wood of Rannoch in Highland Perthshire. Their ideas for a critical forest art practice involve experimenting with the empathetic exchanges between people and trees in urban and rural settings; and considering the processes of art as an interface with a forest in rural settings, and how these correspond with images, ideas and artefacts in an urban setting. At Black Wood, Collins and Goto found centuries of historical, cultural and institutional conflicts over the meaning, value and use of the forest. Through a dialogic, imaginative and place-centred workshop process with the many institutional partners, they were able to re-align an approach to access and awareness of the forest, to begin a re-framing of ecosystems services to include cultural value. As ‘time’ is an essential element in understanding a forest and a public conversation, for the urban / gallery settings, the artists assembled a body of time-based media work, including video installations. The contested or conflictual aspects of a place are embedded in its social history; in the inequalities of economics, class and power; and in the variations in perceptions of value, amenity and even of nature itself. Conflict is a thread running through several projects, if not explicitly represented. Interviews with people connected with the Firth of Clyde showed their differing perspectives, from fishing, scientific, philosophical, ecological, conservationist, underwater and spiritual experiences. Artist Stephen Hurrel and social ecologist Ruth Brennan, in Clyde Reflections, created an immersive film and audio-visual installation of the interviews. Hurrel devised a meditative, ambient structure to the film/installation. Brennan found that this poetic methodology allowed for the implicit ideas and overlaps in interview material to be conveyed, rather than the more informational or confrontational style of a documentary. Mirror Lands critiqued the techniques of nature documentaries that construct an idealised version of nature. Based on the Moray Firth, filmmaker Emma Dove, composer Mark Lyken with ecologist Paul Thompson and colleagues at the Lighthouse Field Station, Cromarty, conducted interviews with people giving their accounts of experience with the local environment. The filming technique highlighted everyday interactions between humans and the environment, rather than the dramatic focus of a nature documentary. One intention of the research was to influence individual behaviours in ways that reduce conflicts like that between the oil and tourism industries and marine conservation. Conflicts between human social and political interests and other species was the direction given by the conservation scientist Steve Redpath for the project Thinking Like a Mountain, with writer Esther Woolfson. Conflict is inherent in issues of sustainability, and represented in this project by human relations with predators. They researched how Scottish literature, law and culture viewed predator species like the wolf and its effects on the shared biotic community. Woolfson traced the etymology of Scots language words for ‘predator’, among her series of non-fiction essays. The ‘science’ in many reports seems confined, but in Search Films, the collaboration opened up the scientific process itself, directly exploring how a science produces its knowledge in a way that melded with an artistic process. The project began as a walk in the woods, as biologist Mick Marquiss described to his son, artist Duncan Marquiss, how he found goshawk sites by responding to cues or idiosyncrasies in the landscape. The hawk is elusive; the subject of study is found by its hawk-signs. That scientific method, that way of walking and observing, is a formalised version of innate foraging behaviour that humans use to find scarce resources in complex environments – on land, but also by extension, while shopping, on the internet. Duncan mimicked this behaviour in the process of film-making, as he followed Mick, as a way of understanding the biologist’s methodology and search patterns. For the scientist, the film-making offered the opportunity to look again at the routines of field studies, the tacit knowledge involved, and at ways that this experiential knowledge could be articulated to others. How to know a place, how to imagine nature features across most projects. In Imagining Wild Land – Coire Ruadh, artists Simon Fildes and Katrina McPherson, with performer Ruth Janssen, worked with Rob McMorran from the Centre for Mountain Studies. Looking at how landscape depends on movement, the artists used video and dance on the land to articulate the scientific data from CMS defining the borders and zones that mark out ‘the wild’. Portraits of Scots Pines explored how the identity of a place is known through that iconic species. Artist Marcus Leotaud contrasted ideas of re-wilding with the dead zones of spruce plantation, and with what constitutes a ‘natural’ landscape in Scotland. Working with PhD candidate William Cornforth and Heritage Management Officer Simon Montgomery, the project viewed the individual tree rather than the forest, as iconic of habitat, landscape, time and history. Leotaud’s portraits of are not merely representational, but portray as well the threats to the species. The animal as a way of imagining nature features in Barnacle Fish or Fowl, by artist Philippa Mitchell and ecologist Carl Mitchell. The visual representation of barnacle geese and how this has affected public perceptions and management decisions about its population was explored with students at Port Ellen Primary School, Islay, in the inner Hebrides. Interrogating how visual representations of Scottish places invent those places, The Valentine Project: A Landscape with Trees, started with historical post cards from Glen Tilt, produced by James Valentine and Sons of Dundee between 1880 and 1935. Moving between the archive, artefacts and the site, the team of artist Victoria Bernie, landscape architect Lisa Mackenzie, historical geographer Fraser MacDonald and field ecologist John Derbyshire walked, drew, photographed, videoed and talked over how to do field work, how to represent constant change in a landscape, the human artifice that shapes it, the future realities of a landscape and the processes of decay, ruin and flux. Another grouping of projects draws out that focus on change in the landscape, with water as the indicative representation of this. In Montrose Bay, the Changing Coast, artist Jean Duncan, zoologist Tracey Dixon and hazard geoscientist Fraser Milne used arts-based public engagement with local groups and schoolchildren to observe the shifting sands of the beach, and to record how it is used and how it might be managed in the future. Using sound recordings, visual art and photography, artist Tommy Pearson and environmental writer and musician Rob St. John used water flows to explore Edinburgh’s urban environment. In Water of Life – City of Edinburgh, they traced the subterranean flows of water in sewers, drains, pipes, rivers and reservoirs, revealing the confluences of clean and unclean, ‘natural’ and ‘unnatural’, the organic and synthetic. Using analogue photography, and with the production of a vinyl record, they kept to a slow artistic methodology. For Making Space for Water: A Poetry of Place, writer Leslie Harrison and environmental engineer Rebecca Wade walked the banks of the Denburn in Aberdeen and the Dighty Water in Dundee, exchanging methodologies for researching the impact of language on perceptions of urban river environments. The project showed how character, history and social function of the river, what it carries with it, is revealed in both ordinary language and poetry. Storyteller Andy Hunter, community archaeologist Brian Wilkinson and public engagement practitioner Sophia Collins walked a river, holding storytelling events with communities and specialists along its length. In Tales of River Tweed, stories were told and stories were collected, marking the flow of history, narrative and river. Finally, in Dreaming Scotland, writer Lowri Potts, sound designer Tam Treanor and photographer Karen Gordon, kept with the human, asking what ‘natural Scotland’ meant to a group of new arrivals to Glasgow, contrasting this with the views of more established residents. Urban parks, the cold, Loch Ness, the traditional skills of shipbuilding, the thinking space offered by the hills outside the city, the light, the softness of the air came through in the interviews. The installation featured recordings interspersing the newcomer and the established resident. Visually, a ‘flock of words’, was animated by an algorithmic, unfixed programme. All these abbreviated summaries miss the detail of the texts, and they, in turn, miss the details of the processes. But as despatches, they mark a time when public funding saw the political, economic and cultural value of supporting collaborations across the aesthetic and ecological worlds. 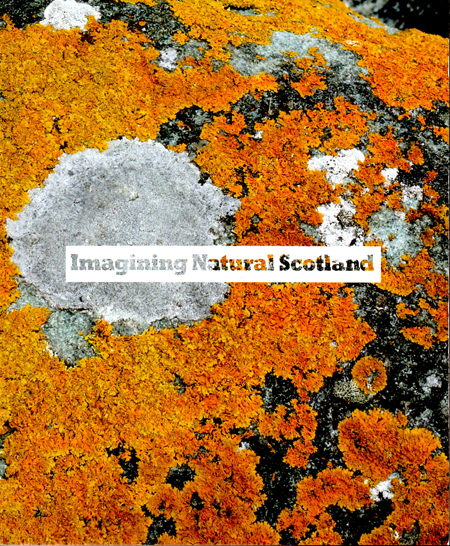 Imagining Natural Scotland (2014), edited by David Griffith, published by Creative Scotland. The Imagining Natural Scotland project was a partnership between Creative Scotland and Scottish Natural Heritage, and supported by the University of St. Andrews. Year of Natural Scotland 2013 was led by VisitScotland, Event Scotland and Scottish Natural Heritage. If you want to obtain a copy of this publication you are best to email Scott.Donaldson@creativescotland.com at Creative Scotland with your postal address and he’ll arrange to send one to you. There may be a charge. Dr. Wallace Heim writes and researches on performance and ecology, and she does this in many places. Her academic slant is philosophical, but she works across disciplines to analyse the experience of performance, of art and of social practice arts, to consider how these events shape ecological and social understanding. She recently published Landing Stages. Selections from the Ashden Directory 2000 – 2014, an ebook marking the archiving of the Ashden Directory and Ashdenizen, websites focused on ecology, climate and culture which she co-edited. Landing Stages can be downloaded from www.ashdendirectory.org.uk. Her current writing is on conflict; on sense and extinction; and on how a place can learn. She has published in Performance Research and in Readings in Performance and Ecology. She is on the Advisory Board of the upcoming publication series Performing Landscapes. She co-edited Nature Performed, and co-curated the conference/event BETWEEN NATURE. She taught on the ‘Art & Ecology’ MA at Dartington College of Arts. She has also worked as a set designer.